Feb. 23, 2018, 11:07 a.m.
By Ricardo Bilton @rbilton Feb. 23, 2018, 11:07 a.m.
For the BBC, bots represent a new way to reach and inform readers who are not deeply engaged in complicated news stories, said Heinrich. One recent bot set out to help users understand how the sharp rise in personal lending might affect them. BBC has also used the tech to help readers catch up on the situation in North Korea and understand the latest flu outbreak. 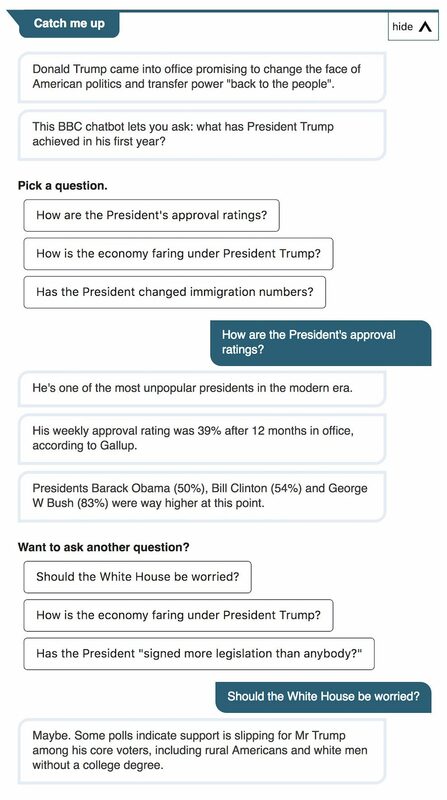 And these bots can all be reused in any piece that reporters think will benefit from deeper background information; the Trump’s-first-year chatbot had run in at least 10 BBC stories. The BBC News Labs and the BBC Visual Journalism team have tweaked and experimented with various parts of the bot project, such as the placement of the bot module on pages, bot design, and whether the bot modules should appear on pages by default, versus forcing users to click a tab before using them. The teams also want to determine how effective the bots within breaking news stories, or even in coverage of entertainment stories such as the Oscars. Another variation on the current bot modules in development now is a timeline feature, which will let users catch up on key events that lead to the current story they’re reading about. The teams are also exploring ways to track where people stop interacting with a bot — particularly a verbose one covering a complex topic — which will let them ping users down the line if the story changes. 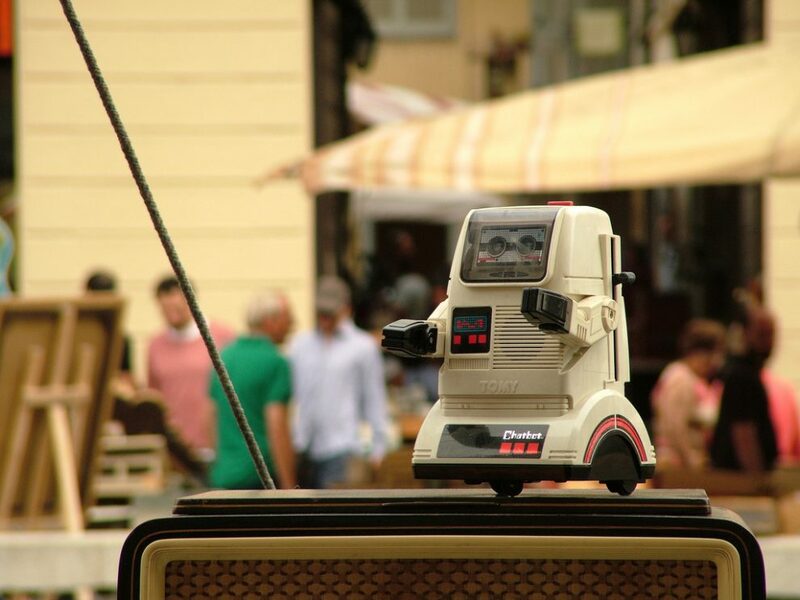 Photo of Tomy Chatbot by Latente used under a Creative Commons license. POSTED Feb. 23, 2018, 11:07 a.m.
Bilton, Ricardo. "With in-article chat bots, BBC is experimenting with new ways to introduce readers to complex topics." Nieman Journalism Lab. Nieman Foundation for Journalism at Harvard, 23 Feb. 2018. Web. 25 Apr. 2019. Bilton, Ricardo. "With in-article chat bots, BBC is experimenting with new ways to introduce readers to complex topics." Nieman Journalism Lab. Last modified February 23, 2018. Accessed April 25, 2019. https://www.niemanlab.org/2018/02/with-in-article-chat-bots-bbc-is-experimenting-with-new-ways-to-introduce-readers-to-complex-topics/.